Studios are available for rental for dance, yoga, music, movement instruction, rehearsals, parties and private events. Please contact us at mimi@mountaincontemporarydance.com for more information. You may register for any class at any time as space allows. Our classes are based on a continuous learning cycle with no starting or ending point. We consider gymnastics and dance year round activities. Both are incredible developmental opportunities for kids of all ages. To see the most growth and progress possible please plan to attend a minimum of 16 weeks of classes and preferably longer to gain the most from your student’s gymnastics and dance education. • Unlike most facilities and programs we Do Not charge a registration fee or membership fee for our Gymnastics and Dance Programs. • Tuition is prorated based on your start date. Students are evaluated through each semester. During these times parents are invited in for a celebration and performance (Winterfest and Springfest)! In addition, our dancers have the opportunity to perform during our Winter Showcase (Daisy dancers and up only) and our Spring Benefit Performance (includes all dancers and combination students). • Spring Benefit: Fee due February 16th with March tuition. We truly believe performing is an integral part of your student’s dance education and strongly encourage all dancers to participate in these positive performance opportunities. Enrollment is continuous between our School Session & Summer Session. There is no need to re-enroll for classes if you plan to continue. Re-enrollment is required at the start of each school year ONLY. We are happy to schedule a make-up for a missed class at anytime as long as your student is currently enrolled. Please remember your tuition pays for your student’s space in class NOT your attendance. Students may withdraw at anytime and are welcome to re-register at their convenience. To withdraw from classes please email accountinglsv@mountain-kids.com, or complete a withdrawal form (available at our front desk) by the 15th of the month prior to the month you wish to withdraw from. (For example: please let us know by February 15th that you wish to discontinue as of March1st). Please make sure you receive a confirmation of your withdrawal. For families brand new to Mountain Kids our guarantee assures if you are not completely satisfied with your class after the first month we will refund all class fees. Refunds must be requested in writing with an explanation of how we did not meet your expectations. Refunds are issued via check or a credit to your account to be used at a later date. We are happy to credit back to your credit card for a $5 processing fee. Mountain Kids will close for morning classes when BVSD schools are closed. We will make every effort to open for all classes 12pm or later that same day. Please check our web site at www.mountain-kids.com or our facebook page at www.facebook.com/mountainkidslouisville for updates. 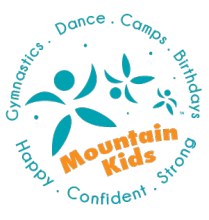 I understand that my registration for classes at Mountain Kids is my authorization for Mountain Gymnastics Training Center Inc. (DBA Mountain Kids) to debit my credit card on the 16th of each month. I understand this debit goes to pay the next months tuition (for example: the debit on February 16th pays tuition for the month of March). I understand I will NOT receive a tuition reminder and it is my responsibility to be aware of the automatic debit scheduled for the 16th of the month. I also understand I can withdraw at anytime and must do so no later than the 15th of the month prior to the month I wish to withdrawal from, to avoid the automatic transaction. I understand my withdrawal must be communicated in writing either via email to fun@mountainkidslouisville.com and or form at front office. I understand I must receive a confirmation of withdrawal to ensure my credit card will not be debited. I understand my tuition pays for my space in class regardless actual attendance.